The Dublin Legends - Sean Cannon, Paul Watchorn, Gerry O’Connor & Shay Kavanagh - have over 60 years of performing experience between them with The Dubliners and Sean Cannon has been the lead singer with The Dubliners for over 30 of them (taking over from the late Luke Kelly). 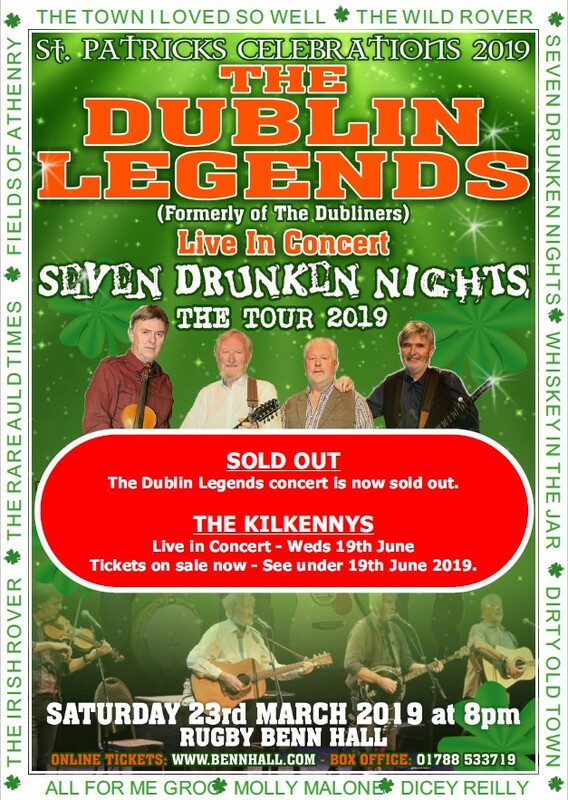 The Dublin Legends will, of course, continue to play all the classic songs and ballads known the world over: “Whiskey in The Jar”, “Dirty Old Town”, “The Wild Rover”, “The Rare Auld Times”, “Molly Malone”, “The Irish Rover”, “Black Velvet Band”, “Seven Drunken Nights” and many more. This will be a full live concert by the Dublin Legends (formerly The Dubliners). Tickets are now on sale for this rousing St Patrick's celebration on the Saturday night of St Patrick's week in 2019.